The Khoikhoi ("people people" or "real people") or Khoi, are a historical division of the Khoisan ethnic group, the native people of southwestern Africa, closely related to the Bushmen (or San, as the Khoikhoi called them). They had lived in southern Africa since the 5th century AD. When European immigrants colonized the area after 1652, the Khoikhoi were practising extensive pastoral agriculture in the Cape region, with large herds of Nguni cattle. The European immigrants labeled them Hottentots, in imitation of the sound of the Khoekhoe language, but this term is today considered derogatory by some. The Khoikhoi named a local river in the area by a word that sounded like "Knysna" to the early Europeans. Scholars offer several translations of the Hottentot term - place of wood, fern leaves, or simply straight down, referring to the steep sandstone cliffs, called The Heads today. Knysna's rich and colourful history spans the days of sailing ships, timber extraction and even a brief period of gold discovery. The vast, indigenous forests just outside Knysna became an invaluable source of timber for buildings, ships and wagons. The town's streets and quaint, old buildings show its recent commercial past, while the rocky coast and deep, silent forests reflect the history of men with bows and arrows - ancient hunters, gatherers and nomads. 1804: George Rex (a timber merchant and the founder of Knysna) purchased the farm Melkhoutkraal, effectively taking ownership of all the land surrounding the lagoon. 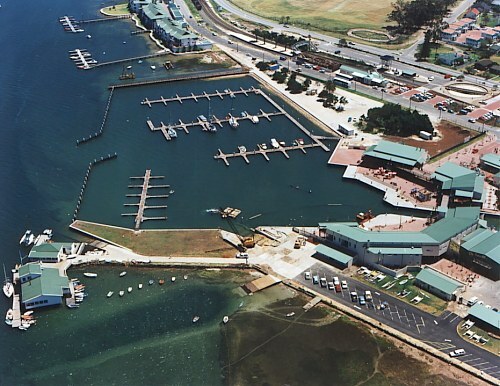 1817: Knysna became a port for naval and commercial ships bringing supplies into the area, and later, for transporting shipments of timber out of the area. 1870: Arnt Leonard Thesen and his family moved from Norway to Knysna and set up the first trading store and counting house. 1876: A gold nugget weighing 17 penny-weight was found by James Hooper in a river bed on his farm Ruigtevlei. The find was significant enough for the authorities to make a grant of 100 pounds for further prospecting (a sizeable sum in those days). 1881: The settlements of Melville and Newhaven united to form the town of Knysna. 1880's: George Parkes, an industrialist from Birmingham, England purchased over 3,400 ha of Knysna forest to provide a source of wood for his factory which was producing edge tools. He established the first primitive sawmill in the forest and a mill conveniently situated in the centre of Knysna. 1885: The search for gold recommenced in the Karatara River after years of postponement and proved to be a successful venture. Many fortune seekers descended on the Millwood area over the next 10 years, until it ceased to be a lucrative operation. 1904: Charles Wilhelm Thesen bought Paarden Island (part of the Melkhoutkraal Estate) and began processing timber on the island (now Thesen Island) in 1922.